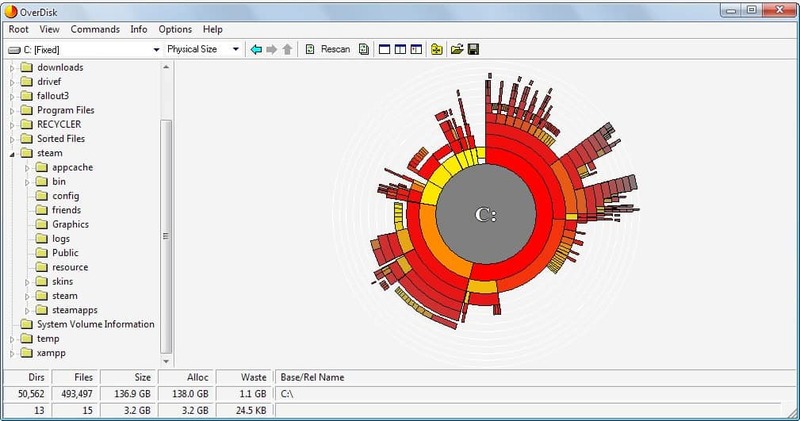 Overdisk is a free program for Windows devices that visualizes the space distribution on hard drives connected to the computer system. What are the five biggest folders on your computer system, or the five biggest files? Windows users will have a hard time coming up with the information if they are not allowed to use third-party software. Windows itself offers little information when it comes to the distribution of space on hard drives. Third party developers have created dozens of tools that provide these information. Some are integrated into Windows Explorer while others are standalone applications that display the disk usage in their interface. Tip: We favor the blazing fast WizTree, but you may use programs such as TreeSize Free as well. OverDisk is one of these software programs. It generates an interesting looking chart after you use it to scan one of the connected hard drives. The chart displays the root level, the folders on that level and most of the subfolders with the size on the chart reflecting the percentage of disk usage on the selected hard drive. Additional information is displayed when hovering the mouse over one of the elements of the chart. This includes the name of the folder, the total number of files and folders, as well as the size occupied on the hard drive. A click on an element will center the visualization on that folder. Overdisk creates an updated chart that displays the different folder levels starting with that folder as the root. This is an easy and convenient way to browse through the folder structure of the selected hard drive. Several statistics are provided in the toolbar menu. Interesting and unusual is the cluster information dialog that displays various cluster sizes and their implication on the used and wasted space on the hard drive. Another option is to run queries to find the largest files, longest or deepest path names, directories with most file entries or bytes and those with greatest wasted space. 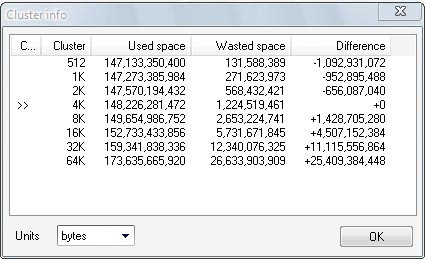 OverDisk is an interesting software program for Windows that visualizes the space utilization of selected hard drives. It is not super useful if you want information on the file level, but may be used for that as well as you can just follow large folders to find the largest files this way. i am a bit confused this because the developer writes” I’ve currently stopped working on it, due to a bug in the libraries of the original developing environment.” also “and (slightly out-of-date) documentation.” and “and the only problem is that it occasionally crashes after several refreshes”. Reading all this and more main quistion to you Martin is do you think that for the moment SpaceSniffer is maybay the better option? S. also SequoiaView ( http://w3.win.tue.nl/nl/onderzoek/onderzoek_informatica/visualization/sequoiaview/ ), which has been around since 2002 or longer. It does a good job and has customizable mode. For a second title scared me into thinking “More SpaceSniffer reviews!?”. Heh, that one is making way fast through tech blogs and it is indeed one of the best treemap visualizations for hard drive I had seen.